The arylalkylamine N-acetyltransferase (AANAT) family is divided into structurally distinct vertebrate and non-vertebrate groups. Expression of vertebrate AANATs is limited primarily to the pineal gland and retina, where it plays a role in controlling the circadian rhythm in melatonin synthesis. Based on the role melatonin plays in biological timing, AANAT has been given the moniker "the Timezyme". Non-vertebrate AANATs, which occur in fungi and protists, are thought to play a role in detoxification and are not known to be associated with a specific tissue. We have found that the amphioxus genome contains seven AANATs, all having non-vertebrate type features. This and the absence of AANATs from the genomes of Hemichordates and Urochordates support the view that a major transition in the evolution of the AANATs may have occurred at the onset of vertebrate evolution. Analysis of the expression pattern of the two most structurally divergent AANATs in Branchiostoma lanceolatum (bl) revealed that they are expressed early in development and also in the adult at low levels throughout the body, possibly associated with the neural tube. Expression is clearly not exclusively associated with the proposed analogs of the pineal gland and retina. blAANAT activity is influenced by environmental lighting, but light/dark differences do not persist under constant light or constant dark conditions, indicating they are not circadian in nature. bfAANATα and bfAANATδ' have unusually alkaline (> 9.0) optimal pH, more than two pH units higher than that of vertebrate AANATs. The substrate selectivity profiles of bfAANATα and δ' are relatively broad, including alkylamines, arylalkylamines and diamines, in contrast to vertebrate forms, which selectively acetylate serotonin and other arylalkylamines. Based on these features, it appears that amphioxus AANATs could play several roles, including detoxification and biogenic amine inactivation. The presence of seven AANATs in amphioxus genome supports the view that arylalkylamine and polyamine acetylation is important to the biology of this organism and that these genes evolved in response to specific pressures related to requirements for amine acetylation. The AANAT family is part of the large and diverse superfamily of GCN5-like acetyltransferases which use AcCoA as the acetyl donor and share a common AcCoA binding fold . Members of the AANAT family share limited sequence identity and are divided into two groups: vertebrate AANATs; and, the non-vertebrate AANATs. The latter are found in fungi, protists, and bacteria and lack defining physical characteristics of vertebrate AANAT [1–3]. The biological role of vertebrate AANAT is to acetylate serotonin in the synthesis of melatonin (tryptophan → hydroxytryptophan → serotonin → N-acetylserotonin → melatonin) [4, 5]. Vertebrate AANAT is associated with biological timing: daily changes in the activity of this enzyme regulate the daily rhythm in melatonin synthesis, which is essential for optimal temporal coordination of biological functions with night/day and seasonal changes and for photic entrainment . The central role of vertebrate AANAT in biological timing has earned it the moniker 'the Timezyme' . Non-vertebrate AANATs are thought to play a detoxifying role by neutralizing arylalkylamines  and a role in DNA biology by acetylating polyamines . Genomes of vertebrates contain a single copy of the AANAT gene, except for teleost fish, some of which possess up to three paralogs , and cows which possess two paralogs (unpublished; NCBI, NIH, http://www.ncbi.nlm.nih.gov). Members of the AANAT family are not in the available genomes of Hemichordates and Urochordates, which leaves open the question of when vertebrate AANAT first appeared in chordates. A striking characteristic of vertebrate AANAT is that it is consistently expressed at significant levels in only two tissues, both of which are photosensitive organs, the pineal gland and retina. This fits with the evidence that pinealocytes and retinal photoreceptors evolved from a common ancestral photodetector [10–13]. The vertebrate AANAT has a neutral pH optimum and exhibits high selectivity for arylalkylamines . Vertebrate AANATs encode proteins that have several highly conserved structural characteristics [2, 8], which facilitate arylalkylamine acetylation and regulation. These features include flanking regulatory regions, which mediate rapid changes in enzyme activity; a pair of histidines which facilitate catalysis ; and, a proline-containing tripeptide in a floppy loop, which confers a high catalytic rate through an effect on substrate binding . Vertebrate AANATs also have high selectivity for arylalkylamines conferred by the binding pocket. Non-vertebrate type AANATs are found in the genomes of most fungi, many unicellular eukaryotes, and a variety of bacteria . The proteins encoded by these genes do not contain the characteristic structural features of vertebrate AANATs. Genes similar to non-vertebrate AANATs are not found in vertebrates. Amphioxus AANATs are of interest in understanding the evolution of vertebrate AANAT because cephalochordates and vertebrates form a clade . Accordingly, the study of the AANAT from this organism might provide new insights into the transition from the non-vertebrate members of the AANAT family to the vertebrate forms. Sequence in the trace archives has indicated that a non-vertebrate type member of the AANAT family is present in amphioxus . The subsequent availability of the near complete amphioxus genome  has allowed us to comprehensively analyze the AANAT family in amphioxus, as presented here. The findings of this study indicate that rapid expansion of non-vertebrate forms occurred in amphioxus and that a vertebrate form is absent. The substrate preference profile of the encoded enzymes suggests to us that they are likely to play a role in detoxification or in biogenic amine inactivation, or both. Branchiostoma floridae (B. floridae, bf) and Branchiostoma lanceolatum (B. lanceolatum, bl) were used; the former were obtained from Gulf Specimen Marine Lab (Panacea, FL, USA) and the latter from the Bay of Banyuls sur Mer (France) . B. floridae heads were used to generate the cDNA used to clone full length bfAANATα and bfAANATδ' that were used for enzyme characterization. B. lanceolatum were used for in vivo studies of gene expression and enzyme activity. They were cultured in sand-filtered seawater under a natural lighting cycle and temperature, as indicated elsewhere . Intensity of the light was 136 lux. For the experiment with constant conditions, animals were housed for 14 days in constant light and/or darkness and then were used for the activity assay. bfAANAT homologs were identified through a tBLASTn search of genomic sequences available at: http://genome.jgi-psf.org. Seven genes for AANAT homologs (α - η were identified in genome assembly v2.0. A second allele for five of the genes was found in v1.0. Based on these sequences, primers were designed (Additional file 1) for cloning of blAANAT cDNAs. qPCR primers for specific gene products were based on the B. lanceolatum clones. The AANAT homologs were identified by searching the non-redundant database of protein sequences (NCBI, NIH, http://www.ncbi.nlm.nih.gov) using the PSI BLAST program  and by searching the genomes and proteomes available at JGI http://genome.jgi-psf.org/euk_cur1.html using the tBLASTn and BLASTp programs, respectively. Additionally, AANAT homologs were detected in the genomes of the red algae Gracilaria changii, segmented worm Alvinella pompejana, Mediterranean mussel Mytilus galloprovincialis (NCBI, EST database) and the basal fungus Rhizopus oryzae http://www.broadinstitute.org/annotation/genome/rhizopus_oryzae/MultiHome.html. Representatives from different groups including bacteria, fungi, protists, and animals were selected for phylogenetic analysis, and a multiple alignment of the respective protein sequences was constructed using the MUSCLE program . A maximum likelihood phylogenetic tree was constructed using the TreeFinder program  by optimizing a default starting tree constructed using the Neighbor-joining method with the Whelan and Goldman (WAG) empirical model of substitutions  To select the best substitution model, we compared the likelihoods of trees constructed using 8 models: WAG (21), JTT , VT , BLOSUM , Dayhoff , cpREV , rtREV , PMB  by running the TreeFinder program ; this test showed the best fit with the data for the WAG model. The reliability of the internal tree branches was estimated using the LR-ELW bootstrap method . A constrained large scale tree topology was created using the TreeView program . Alternative tree topologies were compared with the Approximately Unbiased test  using the TreeFinder program. Evolutionary distances were estimated using the distance matrix created by the PROTDIST program of PHYLIP package  based on a truncated alignment of AANATs and using the Jones-Taylor-Thornton (JTT) substitution model . The mean differences (p-distance) and identities between the major taxonomic groups of AANATs were calculated using the MEGA program . pGEX 4T-1 (GE Healthcare, Piscataway, NJ) was used for the recombinant expression of full-length bfAANATα and bfAANATδ'. The constructed plasmid was sequenced to confirm identity. The construct, which produces a GST fusion protein, was transformed into E. coli strain BL21Gold (DE3) pLysS (Novagen, Madison, WI). The cells were grown at 37°C; when the OD600 = 0.6, the cultures were cooled to 25°C and isopropyl β-D-1-thiogalactopyranoside was added (final concentration = 0.2 mM). The cells were harvested by centrifugation after 12 hours of culturing (5000 × g, 30 min, 4°C) and resuspended in 2× PBS, pH 7.5, containing 10 mM DTT (Buffer A) and a mixture of protease inhibitors (Complete®, Roche, Indianapolis, IN). The cells were then lysed by sonication and the resulting lysate was centrifuged (8500 × g, 25 min, 4°C). The supernatant was mixed with Glutathione-Sepharose 4B affinity matrix (GE Healthcare) pre-equilibrated with Buffer A. The suspension was agitated for 1 h and then packed into a glass column. The column was washed with 5 column volumes of Buffer A, followed by 5 column volumes of buffer containing 50 mM Tris-HCl, 0.1 M sodium citrate, 5 mM DTT and 10% glycerol, pH 7.8 (Buffer B). GST fusion protein was then eluted with 5 column volumes of Buffer B containing 10 mM glutathione. Protein was concentrated and dialyzed against buffer containing 0.1 M ammonium acetate, 25 mM NaCl and 1 mM TCEP; the resulting preparation was stored at -80°C. Where indicated, purified GST-free bfAANATα was used; otherwise, the GST-bfAANATα or GST-AANATδ' fusion product was used, consistent with previous studies [15, 35, 36]. Proteins were resolved on preformed 14% Tris-glycine (1 mm) gels, using the manufacturer's protocol (NOVEX, Invitrogen) . The molecular mass of the proteins was estimated using Rainbow™ markers (GE Healthcare). where A(t) is the observed fluorescence anisotropy at time 't' after the initial addition of CoA-T and koff is the rate constant. where V is the observed enzyme velocity (activity), Vmax is the maximum enzyme velocity, S is the substrate concentration, and Km is the Michaelis-Menten constant. For the measurement of enzyme activity in amphioxus head tissue, the colorimetric assay (see above) was used with 10 mM β-phenylethylamine (PEA) as a substrate and 10 μg of protein from tissue homogenized in assay buffer. For each measurement a corresponding assay was performed in the presence of 1 mM CoA-T , and another in the absence of PEA. The controls used included an assay without tissue homogenate and another with a heat-inactivated (65°C, 5 min) homogenate. Samples were collected at noon and midnight in the experiments studying the light/dark variations, and at noon in all other experiments. Total RNA was extracted from head and from body using a Trizol extraction kit (Invitrogen, Cergy Pontoise, France). 1 μg was incubated with 1 unit of DNase I (Roche; Meylan, France) for 20 min at 37°C. Following DNase inactivation (65°C, 10 min), the sequence was reverse-transcribed using Powerscript Reverse Transcriptase (Clontech, Mountain View, CA). qPCR of the resulting cDNAs was performed with the primer sets qAANAT (Additional file 1) using the 'Light Cycler Fast Start DNA Master SYBR Green I kit' (Roche Molecular Biochemicals, USA) in a total volume of 20 μl as follows: 95°C (10 min), followed by 35 cycles of denaturation at 95°C (10 sec), annealing at 60°C (15 sec) and extension at 72°C (15 sec). qPCR was done using a Light Cycler 1.5 (Roche Diagnostics, USA). Amplification efficiency was measured using serial dilutions of plasmids containing a fragment of the corresponding blAANAT gene. Data were normalized to the average value obtained with three housekeeping genes from B. lanceolatum: L17 (AY130354), L18 (AY130454) and actin (Y13663). The PCR conditions for the housekeeping genes were as indicated above except that the annealing temperature was 66°C for actin. Primers for the housekeeping genes are given in Additional file 1. The tissue distribution of amphioxus AANATα was determined by RT-PCR. Total RNA from different parts of B. lanceolatum was extracted using the Trizol method (Invitrogen); 1 μg was incubated with 1 unit of DNAse I (Roche) for 20 min at 37°C. Following DNAse inactivation (65°C, 10 min), the RNA was reverse-transcribed using Powerscript Reverse Transcriptase (Clontech) PCR amplifications of the resulting cDNAs using Advantage cDNA Polymerase (Clontech) were performed with the primers for blAANATα (Additional file 1), and the following conditions: 95°C (1 min) followed by 30 cycles of denaturation at 94°C (20 sec), annealing at 66°C (1 min) and extension at 68°C (30 sec). In the controls, the template cDNA was replaced by either water or RNA that was not reverse-transcribed. The PCR products were loaded in a 1% agarose gel, in the presence of DNA/Hinf I marker (Promega, Madison, WI). Fragments of the expected size were extracted, subcloned in pGEM-T Easy (Promega) and sequenced. B. lanceolatum were collected at Argelès-sur-Mer (France) in July 2009; gametes were obtained by heat stimulation [17, 38]. Eggs and embryos were fixed in 4% paraformaldehyde (PFA) in MOPS-EGTA buffer and processed for in toto hybridization as detailed elsewhere , except that the chromogenic reaction was performed using BM Purple (Roche) . Two digoxigenin labeled probes corresponding to the α or δζ subtypes were designed. The former was obtained using the cloning primers cAANATαF2 and cAANATαR2 (Additional file 1) and yielded a probe of 453 bp. The latter was obtained using the cloning primers cAANATδζF2 and cAANATδζR2 (Additional file 1) and yielded a probe of 308 bp. Hybridization treatments with the different sense and antisense probes were performed simultaneously. Seven intronless AANAT genes were identified in the B. floridae genome (Figure 1). A second allele was found for 5 of the 7 genes in version v1.0 of the B. floridae genome assembly. The amino acid sequence identity among the amphioxus AANATs ranged from 30 to 86% excluding allele/allele comparisons (Additional file 2). The structural features which characterize vertebrate AANATs, including the flanking regulatory regions, a pair of neighboring histidines in the active site, and a tripeptide in the floppy loop, do not appear in the proteins encoded by the amphioxus AANATs. 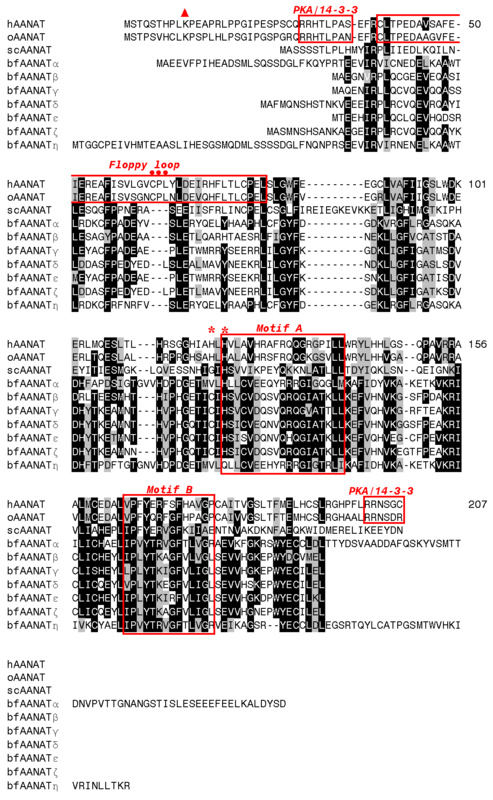 The motifs A and B, which characterize members of the GCN5-like superfamily of acetyltransferases are conserved in both amphioxus and vertebrate AANATs (Figure 1). Multiple alignment of sequences. Alignment of AANAT sequences from human (h), ovine (o) and yeast (sc), compared with the newly identified bfAANATs. Sequences have been aligned using CLUSTALW , and then manually adjusted. Residues inversely highlighted in black are identical; residues highlighted in grey are similar among compared sequences. Motifs conserved in vertebrate AANATs and discussed in the text are identified with labeled red boxes. Individual residues discussed in the text are marked with red symbols. Red triangle: conserved lysine; red dots: three residues lacking in all non-vertebrate AANAT homologs; red asterisks: paired histidines involved in catalysis. See Additional file 2 for amphioxus sequence coordinates and Additional file 7 for alignment of AANAT sequences from more species. The relative locations of the bfAANATs on 3 assembly scaffolds are shown schematically in Additional file 3. The 7 genes comprise 4 groups based on sequence similarity - group 1: αη group 2: β group 3: γε group 4: δζ. Primers were prepared to amplify members of each of the four groups in B. lanceolatum; low sequence conservation prevented amplification of all seven. The resulting PCR products were sequenced and designated blAANATα, blAANATα' blAANATγ, and blAANATγδ (GenBank accession numbers FJ668653, FJ668656, FJ668654, FJ668655, respectively; α' is used to identify the α allele), according to the homology with individual bfAANAT genes; representatives of the other genes were not obtained in this screen. The clone blAANATδζ was designated this way because it could not be reliably ascribed to either the δ or ζ gene based on similarity to the B. floridae counterparts. The amino acid sequence identity between the cloned PCR products for the B. lanceolatum α, α', γ and δζ isoforms and the corresponding B. floridae genes was 94%, 86%, 76%, and 73%, respectively. Comparisons of the amino acid sequences of the cloned blAANATα and blAANATδζ fragments to their B. floridae counterparts are shown in Additional file 4. Examination of the phyletic distribution of the detected AANAT family members shows that the family is represented not only in chordates and cephalochordates but also in some invertebrates such as the primitive metazoan Trichoplax (four paralogs), the segmented worms Capitella and Alvinella, and the mollusk Mytilus. Among non-metazoan eukaryotes, AANAT homologs were detected in different fungal lineages including basidiomycetes, ascomycetes, and the basal fungi Rhizopus oryzae and Phycomyces blakesleeanus, and in many unicellular eukaryotes (protists). The protists in which AANAT homologs were detected include representatives from three supergroups of eukaryotes, namely, plantae, chromalveolates and excavates . In plantae, AANAT homologs were found in green and red algae; among chromalveolates, members of the AANAT family were present in diatoms, oomycetes, and a haptophyte Emiliania huxleyi; and, among excavates, an AANAT homolog was identified in the heterolobosean Naegleria gruberi. AANAT homologs are also present in a number of bacterial lineages including firmicutes, actinobacteria, proteobacteria and the bacteroidetes/chlorobi group (see Additional files 5 and 6). AANATs are relatively short proteins which complicates reliable phylogenetic analysis. Phylogenetic trees were constructed based on an alignment of 65 amino acid sequences (see Additional files 7, 8, 9 and 10). Eight TreeFinder runs were performed for 8 substitution models (see Methods). The ML tree constructed with the WAG matrix was associated with the highest likelihood value. The topology of this tree is incompatible with the species phylogeny (Figure 2). The monophyly of all 7 amphioxus AANATs was moderately supported and these sequences formed an apparent clade with mollusk and segmented worm that was even more strongly supported (Figure 2). However, beyond this invertebrate branch, there were many anomalies in the tree. In particular, vertebrates clustered with ascomycetes and bacteria, whereas the position of Trichoplax remained uncertain. The monophyly of fungi was not recovered, and ostreococii were separated from another green alga represented in the selected set of protists (Figure 2). Unrooted maximum likelihood phylogenetic tree of the AANAT family. The scale bar shows the number of substitutions per position; the numbers in parenthesis show the number of species in the respective branches; and, the number at internal branches show the bootstrap support (%). For the list of species, the sequences in FASTA format and the multiple alignment used for the tree construction, see Additional files 5, 6 and 7. We tested the statistical compatibility of the AANAT tree with the large-scale organismal phylogeny of eukaryotes using the constrained tree approach (see Methods for details). A constrained tree was created (Additional file 11) in which all species were combined into four major clades in accord with the overall organismal phylogeny, namely, bacteria, protists, fungi and animals. Inside the animal branch, with Trichoplax at the root, the amphioxus branch was placed as the sister group of vertebrates, and the segmented worms and mussel were positioned between chordates and Trichoplax. The fungal branch was placed as the sister group of animals. The Approximately Unbiased test result (p-value 0.148) for the tree generated with this approach (Additional files 12 and 13) shows that the "classical" constrained tree topology could not be rejected with confidence although the likelihood of that topology is much lower than that of the best tree shown in Figure 2. The results of the phylogenetic analysis of the AANATs emphasize the major distinction between the vertebrate forms and those from other animals, presumably, owing to a dramatic acceleration of evolution at the base of the vertebrate branch. Beyond that conclusion, however, the results were quite uncertain due to the low information content of the alignment, between-branch differences in the evolutionary rates, and uneven sampling of different groups. A comparison of the predicted amino acid sequences derived from the published genomic sequence and from our cloned bfAANATα (GenBank accession number EU380676) revealed differences in five amino acid residues scattered throughout (Additional file 4). These differences, most likely, reflect the high degree of polymorphism in B. floridae . The effects of these differences are unknown. 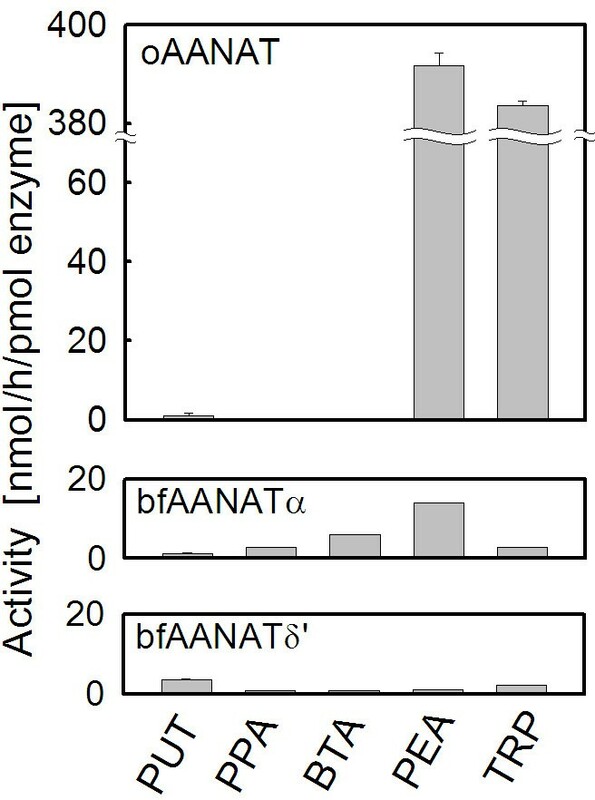 To determine the molecular mass of expressed bfAANATα, the GST-bfAANATα fusion protein was cleaved and bfAANATα was purified as described in the Methods. 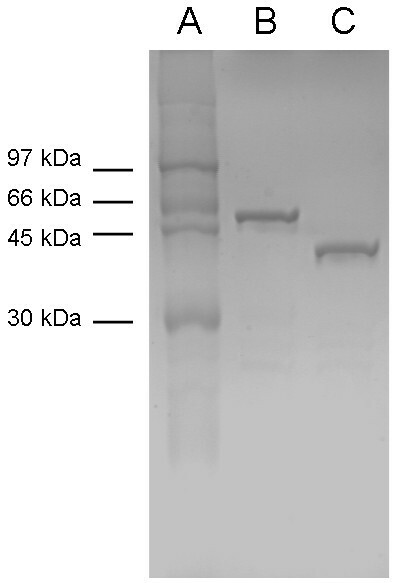 The final preparation contained a single major band of protein which migrated at ~35 kDa on SDS-PAGE (Figure 3). MALDI-TOF analysis revealed the mass to be 28515, corresponding to the predicted mass based on amino acid composition. Using the same procedure we also expressed GST-bfAANATδ'. Characterization of the recombinant bfAANAT proteins. SDS-PAGE analysis of purified GST-bfAANAT α (B) and GST-bfAANATδ' (C), together with the Rainbow™ marker (A). Predicted relative molecular weights are 54,000 for GST-bfAANATα and 46,000 for GST-bfAANATδ'. To establish whether the expressed protein was correctly folded, we measured binding of a fluorescent bisubstrate inhibitor of the expressed protein, CoA-HNE; binding of the inhibitor to oAANAT quenches fluorescence . Here we found that bfAANATα quenched inhibitor fluorescence and that the expressed protein bound the inhibitor stoichiometrically (1:1; Figure 4A). Moreover, binding was totally disrupted by treatment with 4 M guanidine. Accordingly, the purified preparation of bfAANATα is not denatured and possesses characteristics generally similar to those of oAANAT, as regards binding of CoA-HNE. Determination of CoA-HNE binding and off-rate. A. Quenching of tryptophan fluorescence as a function of the binding of inhibitor CoA-HNE by recombinant GST-bfAANATα. Binding was not observed in the presence of 4 M guanidine, which denatures the protein. B. Off-rate of CoA-HNE from the active site of the enzyme was measured by displacement with another inhibitor. Fluorescence anisotropy is shown as a function of time. Samples of proteins (2 μM) were 90% saturated with CoA-HNE. After 5 min the fluorescence anisotropy was measured. At t = 200 s, CoA-T was added to a final concentration of 170 μM and fluorescence anisotropy measurement was resumed. oAANAT data from a previous study are included for comparison . Data are presented as the mean ± S.E.M (N = 3). For further details see Methods. To further characterize bfAANATα, off-rate analysis was done using the displacement strategy described previously , in which bound CoA-HNE is displaced by CoA-T, a non-fluorescent AANAT inhibitor  that does not interfere with detection of CoA-HNE (Figure 4B). 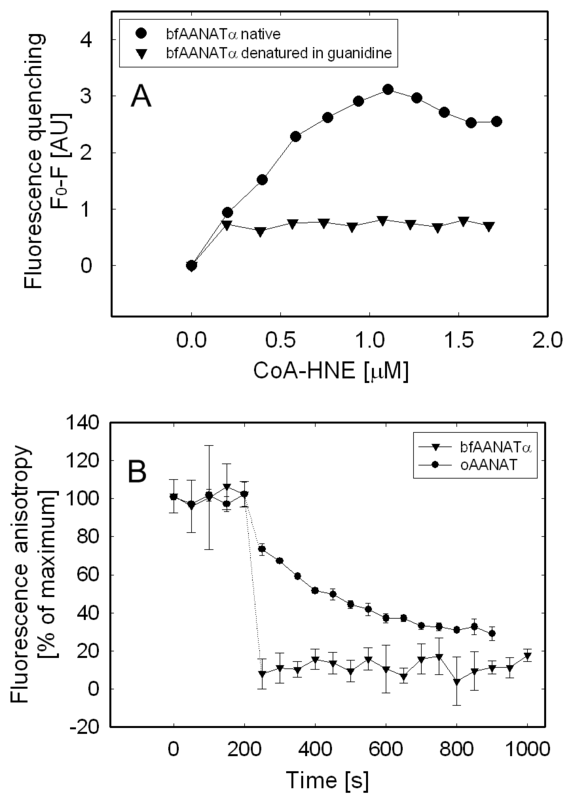 This result shows that the off-rate observed for the CoA-HNE is > 0.05 s-1, similar to that of yeast AANAT; these rates are much faster than that for oAANAT , consistent with the view that the proline-containing tripeptide in the floppy loop of vertebrate AANAT enhances binding of substrate. Activity as a function of pH: GST-bfAANATα and GST-bfAANATδ' both exhibited a pH activity profile that differed from that of ovine AANAT and yeast AANAT as examined using 10 mM tryptamine as a substrate (Figure 5A). The pH optimum for GST-bfAANATα was determined to be 9.0, which differs substantially from published data on fish, ovine and yeast AANAT (6.1, 6.5 and 8.5, respectively) [8, 42]. The pH optimum for GST-bfAANATδ' seems to be even higher. Similar results were obtained using butylamine as a substrate (data not shown). Enzyme activity of GST-bfAANATα and GST-bfAANATδ'. A. pH optimum. Data are presented as the percent of maximal activity for each protein. Data represent results of two independent experiments with the difference of means < 5%. For comparison, data for ovine and yeast AANAT from a previous study are shown . B. Inhibition of GST-bfAANATα by bisubstrate inhibitor CoA-T. C. Acetylation activity of GST-bfAANATα towards tryptamine measured at different temperatures to determine the optimum. Data represent results of two independent experiments with the difference of means < 5%. Data in B are presented as the mean ± S.E.M (N = 3). For further details see Methods. Effect of AANAT bisubstrate inhibitor: Enzyme activity was inhibited by the bisubstrate inhibitor CoA-T  (Figure 5B). The IC50 value (3 μM) was found to be ~10-fold greater than that reported for ovine AANAT . Temperature dependence: The temperature optimum for bfAANATα was found to be 36°C (Figure 5C). This is similar to that of ovine AANAT (37°C), yeast AANAT (42°C) or pike AANAT-1 (37°C) [8, 11]. Substrate preference: The relative capacities of oAANAT, bfAANATα and bfAANATδ' to acetylate a diamine (putrescine), alkylamines (butylamine and propylamine) and arylalkylamines (PEA and tryptamine) were determined at pH 6.8 for oAANAT, and 9.0 for bfAANATα and bfAANATδ' (Figure 6) using GST-fusion proteins. The activity of bfAANATs towards the substrates tested (10 mM) was relatively similar and fell within a 5-fold range of activity; the highest activity was observed with PEA, however, bfAANATα and bfAANATδ' seemed to show a slight preference for hydrophobic or polar substrates, respectively. The Km and Vmax values were determined for five biogenic arylalkylamines: octopamine, PEA, tyramine, tryptamine and serotonin (Figure 7, Table 1). Comparison of acetylation activity of expressed vertebrate and amphioxus AANATs. Acetylation activity of GST-bfAANATα, GST-bfAANATδ' (both at pH 9.0) and GST-oAANAT (at pH 6.8) towards various substrates (10 mM) was determined. PUT: putrescine, PPA: propylamine, BTA: butylamine, PEA: phenylethylamine, TRP: tryptamine. Data are presented as the mean ± S.E.M (N = 3). For further details see Methods. Enzyme activity of GST-bfAANATα and GST-bfAANATδ' as a function of substrate concentration. The enzyme assay with GST-bfAANATα and bfAANATδ' was measured at pH 9.0 and was performed as described in the Methods. Calculated values of Vmax and Km are given in Table 1. Data are presented as the mean ± S.E.M (N = 3). Kinetic characteristics of GST-bfAANAT and GST-bfAANAT ' for selected amines. Activity was measured at pH 9.0. Values are calculated from data in Figure 7. V max values are nmol/h/pmol enzyme and are given as the mean ± S.E.M. (N = 3 to 6). For further details see Methods. In contrast to the relatively broad substrate preference profiles of bfAANATs observed with the substrates tested, oAANAT exhibited markedly higher activity towards the two indolamines, tryptamine and serotonin, and lower activity towards putrescine, propylamine and butylamine. This points to a marked difference in substrate preference: bfAANATα and bfAANATδ' exhibit a broad capacity to acetylate amines, including arylalkylamines and a diamine, whereas oAANAT exhibits a distinct preference for arylalkylamines with an aromatic group, including serotonin, PEA and tryptamine. In some vertebrate species, the nocturnal increase in AANAT activity is accompanied by a ~100- fold increase in the abundance of transcripts . Here we used qPCR to determine whether the abundance of blAANAT mRNAs varied on a night/day basis (Additional file 14). However statistically significant differences were only observed for blAANATα. Accordingly, although it does not appear that there are marked night/day differences in expression of blAANATs, it is clear that small differences do occur. Investigation of tissue expression of blAANATα by RT-PCR revealed the presence of mRNA along the whole body (Figure 8). The identity of the product was confirmed by sequencing (GenBank accession number EU635724; Additional file 4). RT-PCR localization of blAANATα expression. The PCR conditions were as described in the Methods with the forward and reverse RT-PCR primers given in Additional file 1. Note that this PCR was obtained with sexually active B. lanceolatum (i.e., parts 2 to 6 contained eggs). Homogenates of the heads of B. lanceolatum were used for measurement of AANAT activity, using 10 mM PEA as a substrate; CoA-T was added to determine the contribution from AANAT to total acetyltransferase activity. In all conditions tested, activity was significantly higher in heads sampled at midday than in those sampled at midnight (Table 2). Activity measured in the absence of added substrate was more than 50% as high as that measured in the presence of exogenous substrate (PEA); in both cases, activity was nearly completely inhibited by CoA-T, indicating that blAANAT acetylated endogenous substrates during the assay. In other studies this rhythm was confirmed, however a similar daily change was not observed in animals housed in constant darkness or constant lighting (Table 3). A detailed graph describing the inhibition of acetylation activity in homogenates by CoA-T is shown in Additional file 15. Comparison of samples collected during day and night. The exogenous substrate is 10 mM PEA; 1 mM CoA-T has been used for inhibition. Data are given as the mean ± S.E.M. (N = 3 to 6). Acetylation activity under normal light/darkness changes (LD) compared with constant light (LL) and constant darkness (DD) conditions. The pH of the assay was 8.5; data are given as the mean ± S.E.M. (N = 3 to 6). Expression of one or both blAANATs was detected by in toto hybridization at all stages examined, in varying patterns. Although it is difficult to quantify the colorimetric reactions, it seemed that the α form was more highly expressed than the δζ form at early stages, whereas the opposite seemed true at later stages. The first specific hybridization signal was detected at the 8-cell embryo and was stronger in 4 out of the 8 cells. At the blastula stage most of the cells exhibited a diffuse labeling with both probes; however, a group of cells exhibited a more intense dark signal (Figure 9, left side). At the early neurula stage, the labeling appeared diffuse and weak with the δζ probe, whereas some regionalization appeared with the α probe. This tendency was even more apparent at the late neurula stage where the α probe gave a specific labeling in the antero-dorsal (head) and posterio-dorsal parts of the embryo, as well as antero-ventrally in the general area of the intestine. At the premouth stage, no labeling with the α probe was detected, whereas the δζ probe hybridized from head to tail in a dorsal band, corresponding to the neural tube. In toto hybridization of B. lanceolatum. Eggs and embryos were hybridized as indicated in the Methods section either with the α subtype (left column) or the δζ subtype (right column) probes. The central column in the image presents the result of a typical control obtained using a sense probe. In these studies, both α and δζ sense probes were used; neither produced labeling. Bar = 50 μm. For further details see Methods. The publication of the near complete amphioxus genome has marked a new era in understanding chordate evolution . The studies presented in this report, which were made possible by this advance, focus on one family of genes and extends our understanding of this gene family in amphioxus and, potentially, in animals in general. Analysis of the amphioxus genome indicates that it lacks a vertebrate-like AANAT. 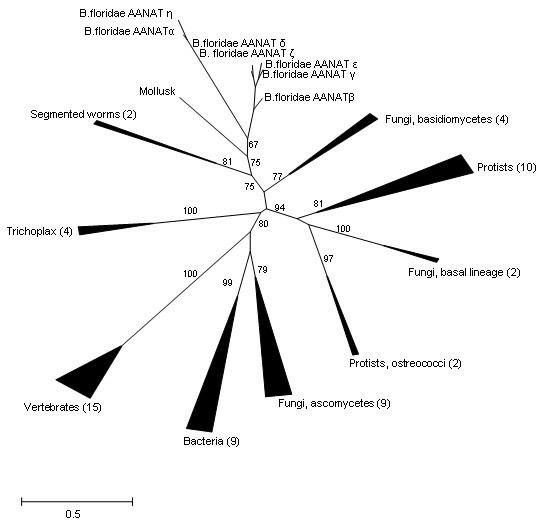 In contrast, our analysis shows that the amphioxus genome contains a set of closely related AANAT homologs that are similar in their gene and protein architectures to homologs from invertebrates, protists, fungi, and bacteria. None of these non-vertebrate homologs possesses the defining structural features of vertebrate AANATs. The discovery of the family of AANATs in amphioxus sheds light on the timing of the emergence of the typical vertebrate AANATs that, most likely, occurred subsequent to the radiation of the vertebrate lineage from the common ancestor with cephalochordates. It appears that the change in the AANAT gene architecture at the base of the vertebrate tree was accompanied by a substantial acceleration of the evolutionary rate which is the likely reason why the amphioxus AANAT homologs are more similar to those from fungi and protists than to those from vertebrates. The results of phylogenetic analysis of the AANAT family presented here were not entirely conclusive owing, in part, to the relatively small number of phylogenetically informative positions in the multiple sequence alignment of the AANAT family, and in part, to the non-uniformity of evolutionary rates, and perhaps, to a rapid divergence associated with evolutionary transitions. The best ML (maximum likelihood) tree showed multiple deviations from the species tree but the topology corresponding to the species tree, including the cephalochordate-vertebrate clade, could not be rigorously rejected. Thus, the phylogeny of AANATs might follow the organismal phylogeny of animals, taking into account the apparent multiple losses, e.g., in arthropods, nematodes, and echinodermata, as well as accelerations of evolution, particularly, in vertebrates. Previous analyses of the phyletic patterns and phylogenies of the AANATs led to the suggestion that horizontal gene transfer, perhaps, even into the animal lineage or the animal-fungal ancestral lineage was a major contribution to the evolution of this family . That possibility still remains considering the patchy phyletic distribution of the AANATs and the irregularities in the topologies of the phylogenetic trees, such as the polyphyly of fungi and the unusual assortment of protists. However, given the lack of strong resolution in the trees, the major changes in evolutionary rates like the one in vertebrates, and the extreme propensity of the AANAT family for gene loss, scenarios that involve unusual routes of horizontal transfer should be addressed with much caution. The biochemical characteristics of bfAANATα and bfAANATδ' were analyzed in this study. Both appear to have significantly lower intrinsic activity at pH 6.8 as compared to oAANAT. The substrate preference spectrum of the bfAANATs is broader than that of oAANAT. As with other non-vertebrate AANATs, these differences are likely to reflect differences in the primary structure of the enzyme, including the presence in vertebrate AANAT of two histidines near the site of acetyl transfer. These are thought to be part of a proton wire which accelerates catalysis by facilitating the expulsion of protons generated during acetyl transfer, thereby preventing their accumulation and the resulting acidification of the active site (7). Another important difference in the primary structure between vertebrate and amphioxus AANATs occurs in a floppy loop which is critical for catalysis, apparently by increasing the dwell time of amine stubstrates in the binding pocket . The floppy loop of the vertebrate AANATs is three residues longer than that of known AANAT homologs, including amphioxus. This addition appears to enhance catalysis by directing the movement of the floppy loop and preventing intramolecular interactions which inhibit binding. As a result, the off-rate of substrate is substantially increased when these three residues are experimentally deleted . During the course of evolution these three residues were added and, as shown here, this was associated with a decrease in the off-rate relative to that of amphioxus and yeast AANATs . Our studies revealed that blAANATα is expressed throughout the body (Figure 8), in contrast to the pattern of expression of vertebrate AANAT, which is primarily limited to structures located in the head: pineal gland, retina and in some cases the pituitary gland . The development of these structures is strongly dependent on expression of the transcription factor Pax6. Pax6 expression in amphioxus is limited to the frontal organ and lamellar organ; the latter has been identified as a possible pineal precursor, based on its medial location and presence of photoreceptors in the tissue . The in toto hybridization analyses revealed expression of both α and δζ genes early in development in B. lanceolatum. It seems that the relative strength of expression changes during development. blAANATδζ was found to be expressed in a region close to the neural tube. 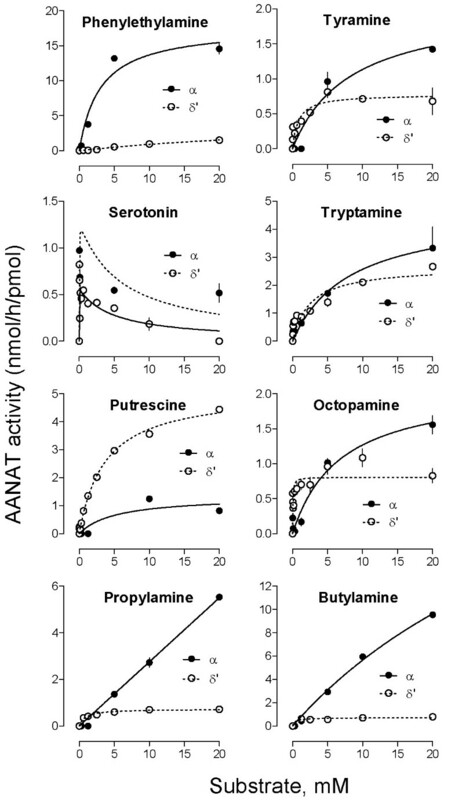 This observation and the finding that these bfAANATs acetylate the biogenic amines serotonin and octopamine (Table 1, Figure 7), suggest to us that it is reasonable to consider that these enzymes play a role in the metabolism of these neurotransmitters. The unexpected finding that several of the seven AANATs in the amphioxus genome are expressed is in sharp contrast to the situation in vertebrates, most of which contain only a single AANAT. The existence of multiple bfAANAT genes seems to be the product of several duplications of this gene because there is no evidence of genome duplication events within the amphioxus line. Thus, the AANATs of amphioxus represents a typical lineage-specific expansion of a paralogous gene family, a phenomenon that is widely observed in eukaryotes and is generally thought to reflect specific physiological adaptations . The lineage-specific expansion of AANATs in amphioxus is the most extensive so far detected for this family but smaller expansions are seen in Trichoplax, as demonstrated here, and in teleost fish. The finding that the amino acid sequences of some of the paralogous amphioxus AANATs are less than 40% identical suggests distinctly different substrate preferences, stability and kinetic characteristics. Based on these findings, it seems reasonable to hypothesize that each of the bfAANAT paralogs plays a unique biological role. This function is obviously not the time keeping by melatonin synthesis as it is in vertebrates, since there is no circadian rhythm in the blAANAT activity; moreover, no melatonin has been found in amphioxus (our unpublished observation), and attempts to identify melatonin receptors in amphioxus were unsuccessful . One likely function of bfAANATs is detoxification. As discussed above, this possibility is supported by the observation that bfAANATα and bfAANATδ' acetylate diamines and alkylamines, in addition to arylalkylamines. Amphioxus lives buried in sediment, and, under these conditions, a wide range of AANAT substrates might be generated as a result of biodegradation. These molecules could be nonspecifically ingested or otherwise absorbed by the organism and as a result might represent a challenge to amphioxus physiology. Under these circumstances, the presence of multiple copies of AANAT would provide a critical survival advantage. Considering the similarity between the life styles of amphioxus and Trichoplax, it is tempting to speculate that these animals experience similar pressures from toxic environmental molecules, driving the fixation of gene duplications in the AANAT family. It is also possible that the functions of one or more bfAANATs evolved from detoxification and pH regulation to a more specialized role in neurobiology. This suggestion is based on the evidence that demonstrated substrates of bfAANATα and bfAANATδ', serotonin and octopamine, are thought to play a role in neurotransmission in amphioxus [48, 49]. The acetylation of these compounds by bfAANATs is likely to inactivate them, thereby contributing to the process of neurotransmission by termination of neural stimulation. Transmitter inactivation is essential for efficient neural signaling. In closing, it should be emphasized that the study presented here characterized only two of the seven bfAANAT proteins. Accordingly, it is possible that other family members have distinctly different substrate preferences and unique biological roles. We found a daily rhythm in total AANAT activity, with high values during the day. The finding that a daily rhythm in head AANAT activity did not persist under constant light or constant darkness conditions is consistent with the interpretation that the AANAT rhythm is not driven by a circadian clock, such as that found to operate in the amphioxus head . The unexpected finding of multiple bfAANAT homolog genes points to the importance of this gene family in amphioxus. The function of these genes appears to be detoxification of exogenous and endogenous amines, the latter including neurotransmitters. It will be of interest to determine the precise distribution of each gene, how their expression is regulated and how each gene contributes to amphioxus biology. This work was supported by the NIH Intramural Research Program through the NICHD, National Institutes of Health. The costs of publication of this article were defrayed in part by the payment of page charges. This article must therefore be hereby marked "advertisement" in accordance with 18 U.S.C. Section 1734 solely to indicate this fact. Work was also supported by the CNRS, UPMC and the French National Research Agency (project TEMPANAT, ANR-07-BLAN-0097). We are grateful to Dr. Dan L. Sackett for help with fluorescence measurement and Drs. Howard Jaffe and Sam J. Clokie for help with the MALDI-TOF analysis of protein samples. JP performed biochemical, physico-chemical, molecular biological studies and drafted the manuscript, SS participated in biochemical studies, LB participated in biological studies, SLC participated in molecular genetic studies and helped to draft the manuscript, JLW participated in biochemical studies, GB, PG and JF participated in biochemical and biological studies, MVO and EVK performed sequence and phylogenetic analysis and DCK conceived of the study, participated in its coordination and helped to draft the manuscript. All authors read and approved the final manuscript.